Sometimes you build a relationship with a book before you even begin reading. Sometimes, it’s once you’ve finished and have had a chance to reflect and review. 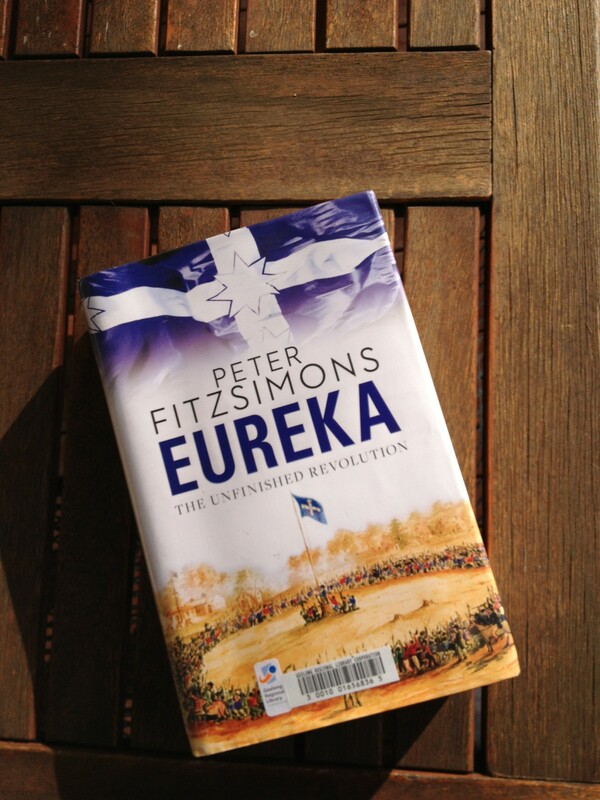 I began to love Peter Fitzsimons’s Eureka midway through its prologue. With only a skeleton knowledge of the Eureka rebellion – gleaned from sketchy Australian History classes – I hoped this tome would put some flesh on the bones. The prologue, with its international political context and teasingly close local references had me hooked. I loved being reminded that Melbourne came stonkingly close to being known as Batmania and that William Buckley, the larger-than-life escaped convict, had wandered these parts with the indigenous Wautharung people for 35 years. There was even a Charles Dickens reference in there. I sensed the story about to unfold was one of substance and detail, and I anticipated the read with eagerness. I was not disappointed. At 696 pages, Eureka is a daunting adventure – one I would probably not have embarked on had it not been a prescribed book club read. And isn’t that the true gift of book clubs, that you tackle books you would otherwise not? Peter Fitzsimons has a remarkable gift for weaving historical narrative rich with primary source documentation and commentary. I’d wondered how the characters might come alive but they were carefully drawn in an astutely researched montage of media, court and official documentation of their day. They were, in a sense, peer reviewed in the language and the context of their times, potently capturing the spirit of the 1850s goldfields and the troubles of those who lived and governed. Amplifying tensions were gloriously played out in newspaper articles, official reports and conversation accounts. Fitzsimons’s lively commentary held me engaged and involved. Often I felt as if I were reading a novel, rather than a historical recount. I knew what was coming, but I knew not how and became totally immersed in the unfolding story and the myriad of “sliding doors” moments in the lead-up to the tragic outcome. And then came the Epilogue – a whole other level of understanding of the main characters and their post-event lives. I found myself carrying this book with me everywhere, lest I should miss an opportunity to read a few pages. 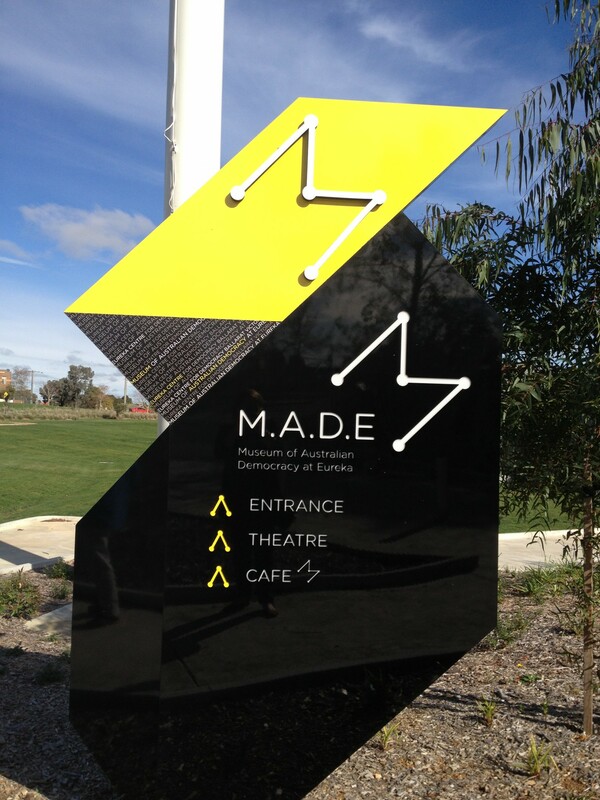 Mid-way through, I felt compelled to visit Ballarat (where the events took place) and spent several hours exploring the Museum of Australian Democracy at Eureka (MADE), which is purportedly built on the site of the original Eureka Stockade (within an hour’s drive of my home). 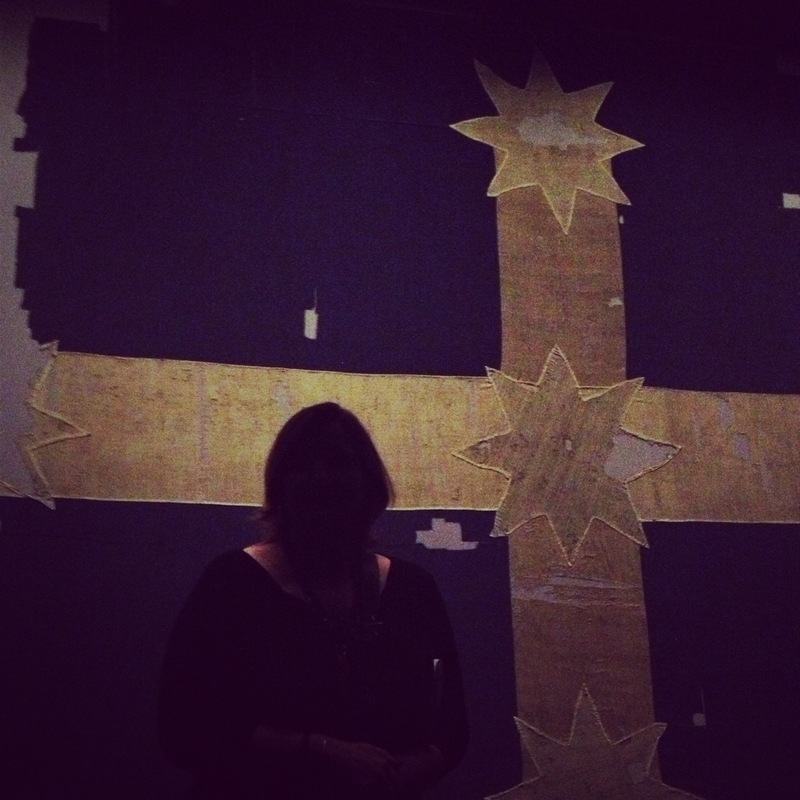 I even persuaded my accomplice to snap a no-flash photo of me in front of the original Eureka Flag on display there. That silhouetted figure is me ignoring the “No Photography” signs. Call me rebellious. On that same day, the local Ballarat newspaper ran a story about a rare copy of Raphaello Carboni’s The Eureka Stockade coming up for auction. Carboni was a key protagonist in Eureka and, after the rebellion, penned a book, which has become an important reference for researchers and those interested in the events. Peter Fitzsimons has gotten in my head and under my skin with Eureka. I’m certain my future holds more adventures into history when I dive into some of his other renowned books. For now, I have Kokoda in my reader crosshairs and can’t wait for the November 2014 release of Gallipoli.